Hi everyone! It's time for a new TTC over at Scrappy Moms Stamps. The challenge this time is to create a project using a silhouette cut. There so many fabulous ones in the Silhouette Store is hard to pick. I finally decided on this cool jack o' lantern cameo frame from Samantha Walker. I cut a scrap of yellow paper to put behind is face. I sprayed the scrap with adhesive, adhered in place, and then sprinkled with yellow glitter to give him some sparkle. This cool chevron paper is from American Crafts. I got it at Target...they have some really cool embellishments to match. 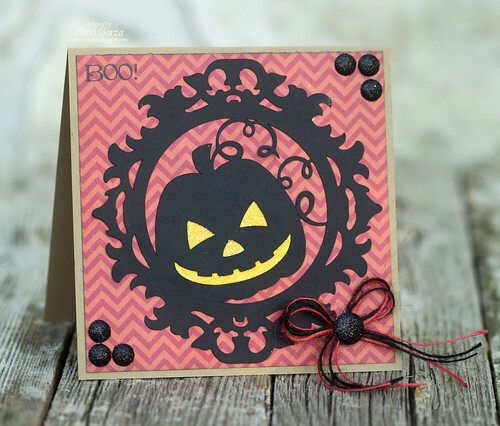 Head on over to Scrappy Moms Stamps to play along for a chance to win a new stamp set!